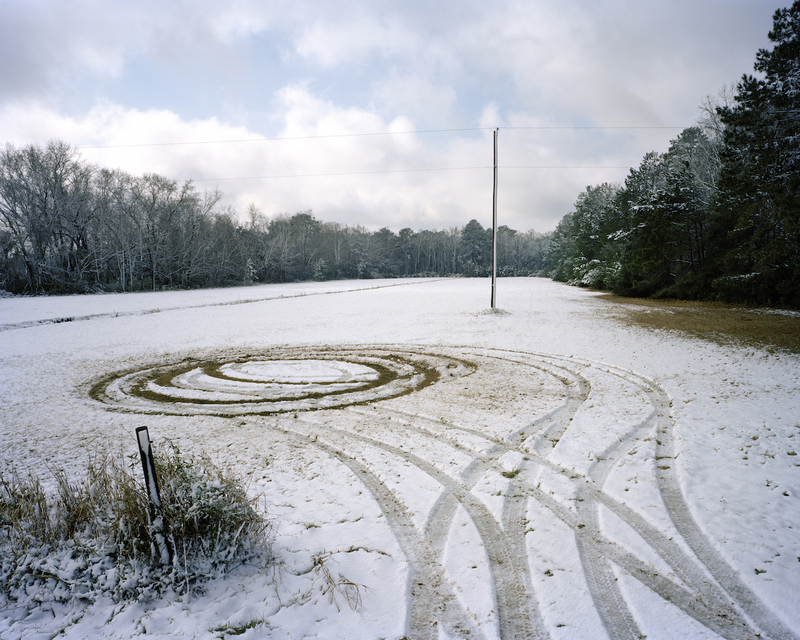 First Snow in Twenty Years, Rosa Scott Road, a photograph by Eliot Dudik currently in the exhibition Southbound: Photographs of and about the New South, piece illustrates the stereotypical culture of the south. One can imagine a group of “good ol’ boys” in a pickup truck rolling into this field on the side of the road just for the joy of making a donut in the fresh snow. The photograph is a part of Dudik’s Road Ends in Water series. Starting in 2009, the series was meant to circumvent the growing tourism development in the south-particularly the South Carolina lowcountry where Dudik completed his undergraduate studies. He aimed to capture the fading southern small town, evoking Walker Evans’s work for the FSA in the first half of the twentieth century. The work features primarily muted colors, with only a subtle green coming to the forefront, giving an aged and almost antique appearance. This references the less-developed environment of these rural communities. Formally challenging, the space is cut in half by the band of dark trees; this horizontal line is then abruptly cut into by the light grey telephone pole, further showing how the growing development in the lowcountry is impacting the natural environment. This telephone pole is juxtaposed with the organic, flowing lines of the donut in the field. The tire marks are a temporary imposition on the landscape that will fade or be covered with snow. However, the structures of development like the pole will continue to mark the landscape. Through this visual composition First Snow in Twenty Years, Rosa Scott Road shines light on these rural communities and their stereotypical behaviors and how their way of life is being challenged by the growing development of the environment. image: Eliot Dudik, First Snow in Twenty Years, Rosa Scott Road, 2010. From the Road Ends in Water series. Edisto Island, South Carolina.